All Our Worldly Goods includes a lot more war – the story moves like a family saga from prior to World War I through the beginning of WWII. This is Nemirovsky’s last completed novel, written prior to Suite Francaise but not published in France in book form until 1947. All Our Worldly Goods is also about the French class structure and love which were still huge issues in French ca. WWI, as reported so well by Proust. It’s about all sorts of different kinds of love and loss and loyalty. The setting is the fictional town of Sainte Elme in northern France – not too far from the Belgian border. The plot – Agnes Florent, a lovely girl from the merchant middle class, and Pierre Hardelot, from the bourgeois “middle” class, are lifelong friends and lovers – they want to marry but his family objects – they have their own woman picked out for him and he is engaged to her. In fact, the whole community would object if they knew because that kind of cross-class marriage was NOT done. But following the discovery of the romance by Agnes’s mother and Agnes’ fiancé (it destroyed Agnes’ marriage prospects), they marry anyway. A few years and one son later the Great War breaks out. Pierre, who has now been disinherited by his grandfather, Julian Hardelot, the ultimate patriarch and total control freak, is called to battle. The Germans march through the town. The families are not friends but they try to get along for the sake of the children. Pierre’s mother dotes on her son while his father is totally out of Julian’s good graces. He gets the woman Pierre was supposed to have married (the one with lots of money) and her husband (an older man) to run the factory. Life happens in the next couple decades, children grow up, but the years do not lessen the underlying animosity between the families. And then its the turn of the next generation and WWII. 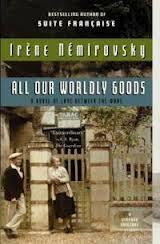 All this in the space of 260+ pages – and Nemirovsky hits the emotional nail on the head – she whacks it.